Military Honors is a free entitlement for all honorably discharged veterans. 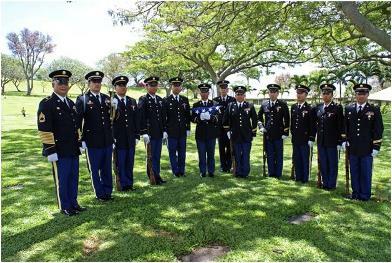 Hawaii National Guard Funeral Honors pays tribute to our veterans who served and stood strong protecting our great country, the United States of America. The rendering of Military Funeral Honors for United States Armed Forces veterans is a tribute that our veterans and their families justly deserve. Section 578 of the National Defense Authorization Act for Fiscal Year 2000 requires the Department of Defense to provide, upon request, Military Funeral Honors (MFH) for eligible veterans. Any person (Active, National Guard, or Reserve) who has completed at least one enlistment or other obligated military service (officer) and received an honorable discharge is eligible for Military Funeral Honors. Military Funeral Honors may not be furnished for any individual convicted of a capital offense under federal or state law for which the person was sentenced to death or life without parole.